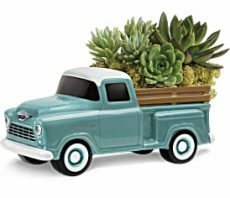 This is the perfect package for the couple that wants to include fresh flowers for their wedding party and their venue while still keeping a budget in mind. You will have many seasonal garden flowers to choose from, an almost endless selection of colours and textures and your bouquets can be handtied with satin, burlap or lace. The Forever Beloved Casket Spray beautifully illuminates the atmosphere of their final farewell service. 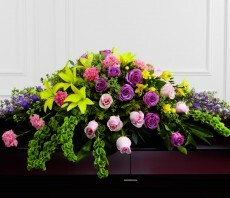 Lavender roses, pink roses, lavender larkspur, pink carnations, Bells of Ireland, yellow Asiatic lilies, yellow freesia, solidago and lush greens are arranged to create an extravagant display of floral beauty that offers comfort and peace to the friends and family of the deceased. Approximately 43"W x 30"D.
The Always Remembered Bouquet is a colorful symbol of a life that will never be forgotten. 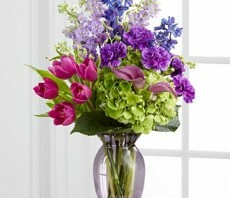 Purple tulips, blue delphinium, lavender mini calla lilies, purple carnations, lavender larkspur and green hydrangea are gorgeously arranged in a clear purple designer glass vase to create an emotional tribute that conveys your deepest sympathies. 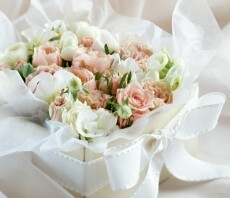 SMALL bouquet includes 18 stems. 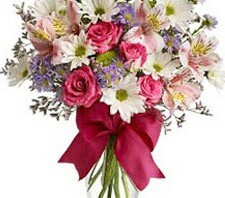 Approximately 20"H x 12"W. MEDIUM bouquet includes 23 stems. 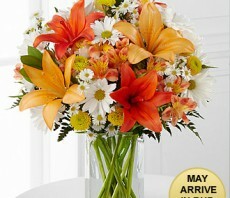 Approximately 21"H x 13"W. LARGE bouquet includes 28 stems. Approximately 22"H x 14"W.
The Truly Loved Basket exudes fantastic color, warmth and cheer to convey your most heartfelt sympathies for their loss. Purple tulips, fuchsia spray roses, lavender carnations, lavender larkspur, lavender button poms, jade spider chrysanthemums, green hypericum berries and lush greens are beautifully arranged in a brown willow basket to create a wonderful way to show how much you care. 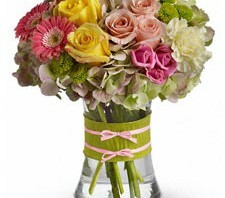 SMALL basket includes 15 stems. Approximately 18"H x 14"W. MEDIUM basket includes 20 stems. Approximately 19"H x 16"W. LARGE basket includes 24 stems. Approximately 21"H x 17"W.